What is a Weather Station & How Does It Work? A weather station is a device which collects and reports environmental, atmospheric and weather related measurements. It consists of a group of sensors which take the measurements and a central console or data logger which collects and reports the measurement data received from those sensors. This data is used to gauge current weather conditions as well as to make short-term weather forecasts. Some of your more full featured consoles have the facility to be connected to a computer where the data can either be stored for statistical analysis or uploaded to a web site. A typical weather station includes a barometer, an anemometer and wind vane, a hygrometer, a thermometer and a self-emptying rain gauge. The majority of weather stations also include sensors to measure the temperature and humidity indoors as well. More complex professional weather stations might also include ultraviolet or UV light sensors, solar radiation sensors, a snow gauge, soil moisture sensors, leaf wetness sensors, soil temperature sensors and water temperature sensors. Some professional weather stations can also measure the amount of evapotranspiration which is very useful in the agricultural industry. Weather stations come in two variations, wireless and wired. Each setup has it's particular strengths and weaknesses so be sure to read our comparison of wireless vs. wired weather stations. 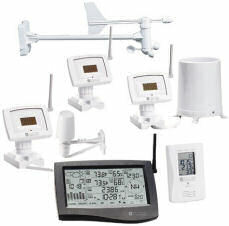 At Weather Station Supply you'll find the lowest discount prices on weather stations and other weather related equipment. We'll help you find the right environmental measurement and weather forecasting equipment for your home, farm or business for the lowest price. Browse the selection of weather stations that are currently for sale on eBay - you simply won't find lower prices anywhere else! If you don't see exactly what you need search here to perform a more comprehensive search.